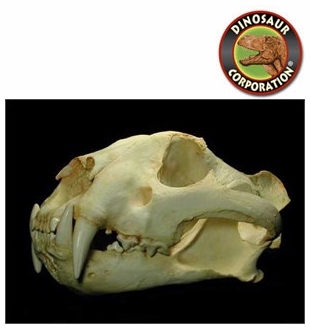 Bengal Tiger skull replica is cast from original specimen. Pantera tigris. Male skull. CAS specimen. The Bengal tiger (Panthera tigris tigris) is the most numerous tiger subspecies. By 2011, the total population was estimated at fewer than 2,500 individuals with a decreasing trend. None of the Tiger Conservation Landscapes within the Bengal tiger's range is considered large enough to support an effective population size of 250 adult individuals. Male Bengal tigers have an average total length of 270 to 310 cm (110 to 120 in) including the tail, while females measure 240 to 265 cm (94 to 104 in) on average. The tail is typically 85 to 110 cm (33 to 43 in) long, and on average, tigers are 90 to 110 cm (35 to 43 in) in height at the shoulders. The weight of males ranges from 180 to 258 kg (397 to 569 lb), while that of the females ranges from 100 to 160 kg (220 to 350 lb).